At the Missouri Botanical Garden, we regard teachers as close colleagues. The role they play in our world is simply heroic, and we thank them for their daily, unwavering commitment to creating curious, lifelong learners. To support and strengthen teachers, we offer a diversity of courses, workshops and other experiences in the summer and throughout the school year. Some schools and districts count Garden professional development toward district-required professional development units. College credit is available for select summer workshops. For more information, please call (314) 577-0819 or e-mail teachertraining@mobot.org. Tuesday, February 12, 2019; 4–7 p.m.
Get a full understanding of how special waste should be processed. Build confidence in your own content knowledge. Learn best practices to encourage environmental stewardship in students. Develop students’ problem-solving and critical thinking skills. Help students plan, implement, and evaluate projects with real-world impacts. Access cross-curricular, inquiry-based materials and lesson plan. Thursday, March 14, 2019; 4–7 p.m. Learn how compost is vital to reducing waste. Build confidence in starting composting in your own school. Access cross-curricular, inquiry-based materials and lesson plans. Get started in building your knowledge and understanding of stormwater issues in our area! This workshop is designed to facilitate teachers’ desire to learn more about stormwater management and water quality while introducing new ways to bring this topic back to their students. Educators who attend will earn their Clean Water Educator Certification and will be trained on the use of EnviroScape models. This workshop is FREE to attend; eligible educators will receive a $75 stipend upon completion of workshop. Lunch will be provided. Sunday, March 3, 2019; 2–4:30 p.m. Please join us in attending our Ecological Restoration Workshop for Educators. Both formal and informal educators are invited to attend. This workshop is focused on providing educators (teachers, boy/girl scout leaders, community leaders, and more) with the resources they need to introduce ecological restoration into their curriculum and lesson plans. Even if you don't fall into the educator category, feel free to join us to learn more about how you can get a group together in your community to not only manage invasive plant species, but to transform your green spaces into healthy habitats and to increase biodiversity in our region. This is a free event and teachers serving students at all ages are welcome. Contact Allison Brown, Restoration Outreach Coordinator at Missouri Botanical Garden, with any questions: abrown@mobot.org or call (314) 577-9473, x 76312. The City Nature Challenge is coming up again this April! In 2018, the St. Louis metropolitan area placed 12th out of 65 cities competing to see which could record the most observations of living things in the region. We're competing again in 2019, and this year's field of competition has more than doubled! This is a great time to get acquainted with iNaturalist, and introduce your students to its use. You'll be contributing to real ecological study of the St. Louis region, and helping us retain our title at the same time! Saturday, March 9 from 9 a.m.–noon at the Missouri Botanical Garden's PlantLab. These workshops are open to formal and informal educators, scout leaders, and homeschooling guardians throughout the combined statistical area around St. Louis, including the city and the following counties in Missouri: St. Louis, St. Charles, Jefferson, Franklin, Lincoln, Warren, Washington and St. Francois, as well as the following counties in Illinois: St. Clair, Madison, Macoupin, Clinton, Monroe, Jersey, Bond and Calhoun. This 2-day workshop kicks off a year-long partnership with Litzsinger Road Ecology Center (LREC). Learn how to become familiar with your schoolyard and how to use it a as a rich learning environment with your students. Visit Litzsinger Road Ecology Center's website for additional details and to register. Administrators—Are you looking for professional development opportunities for your staff? 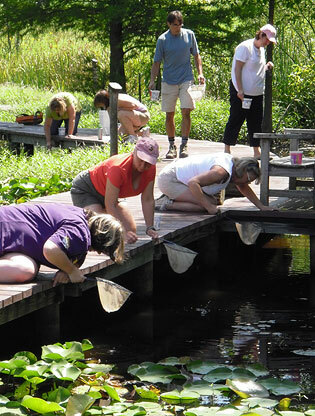 The Missouri Botanical Garden's School Programs team offers topnotch STEM and inquiry training for K–12 that can be incorporated into an established professional development day or offered as an evening or weekend program at your school. Programs typically last 45–60 minutes and serve up to 30 teachers. Additional programs may be scheduled within the same day to serve larger groups. $150 for the first hour and $50 for each additional hour (to take place the same day). Please call (314) 577-0819 or e-mail teachertraining@mobot.org to discuss programming options. View presentations from our latest educator summit.